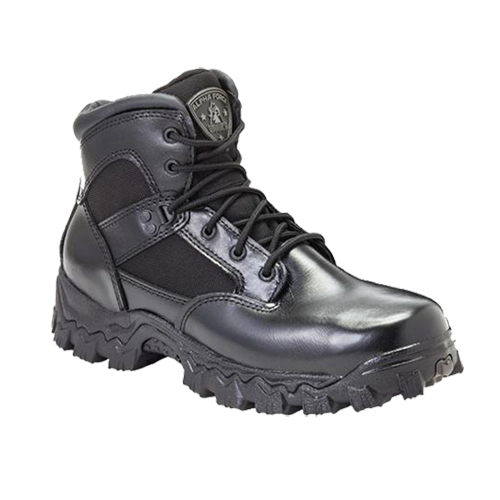 One of our bestselling Rocky boots is the Alpha Force, shown here. It is popular because it’s functional, durable and it fits great. This style features a non-metallic composite toe cap. 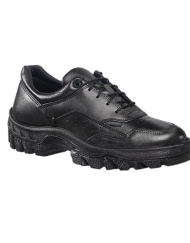 The combination of this toe cap along with the other features allows this style to meet the highest ASTM F2413-05 Protective Toe footwear standards for Impact & Compression resistance. 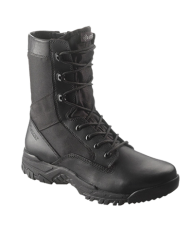 Rocky® Outdoor Gear is a world leader in rugged outdoor and occupational footwear. Their corporate office, warehouse, and distribution center accompany the original manufacturing building in Nelsonville that goes back to 1932. An additional feature is its Rocky Waterproof construction. It combines a waterproof inner layer with the upper providing a barrier that helps keep water out and feet dry. Another key comfort feature is the contoured removable polyurethane cushion insole providing direct underfoot cushion comfort. 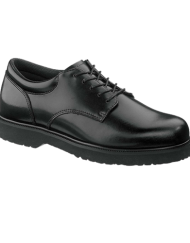 The polyurethane material used in its insole is known for its cushioning while not bottoming out features. Some open celled foams feel very comfortable to the initial touch, but will tend to break down faster than a product made with polyurethane. Plus, it is extra thick in the heel contact area. This provides additional underfoot comfort to the wearer. 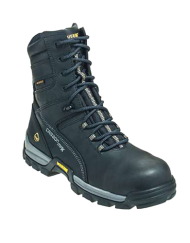 In addition to meeting the highest ASTM F2413-05 Impact & Compression standards, this boot also complies with its Electrical Hazard standards. This type of work boot is made with insulating bottoms providing secondary electrical hazard protection to those areas dealing with open circuits under dry conditions, but also can be worn in work areas requiring only basic protective toe work boots.